The signature rooftop igloos at Envoy Hotel officially reopen on Saturday, November 11, 2017 and run through April 16, 2018. Enjoy a variety of specialty cocktails created by master mixologist Brain McDougall as you gather with family and friends to take in the breathtaking views of Boston’s picturesque skyline and harbor. 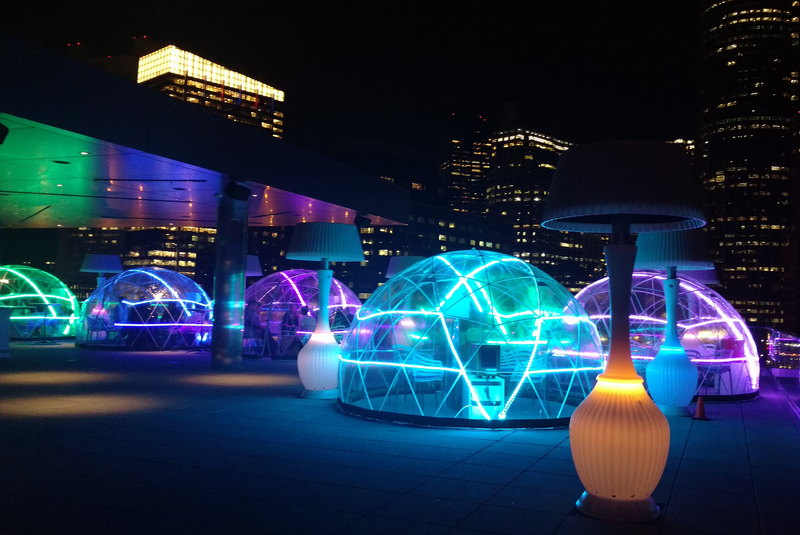 This exclusive pop-up igloo bar consists of six, heated igloos and is open Wednesday through Saturday from 4 to 10 p.m. The igloos are primarily given out on a first come, first serve basis, arrive early to make sure an igloo is available. Each of the six igloos sits eight to ten people, comfortably. To ensure you stay warm, we provide fleece blankets to kick up the cozy factor. To get a drink, you need only press a button, which will illuminate the igloo and notify a cocktail server of your request.